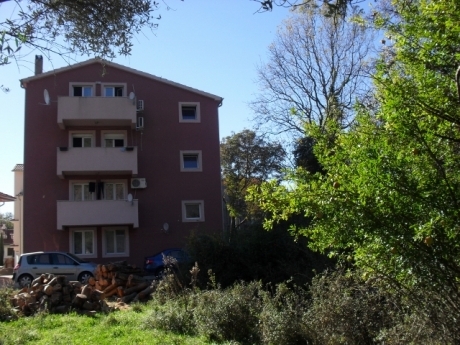 Two bedroom apartment for sale in a peaceful village of Gradiosnica Gradiosnica is a place near Tivat, it is 1,5 km for away from Tivat's airport and 4 km far from the centre of Tivat.The nearest market and school are 1 km far from the apartment. This two bedrooms apartment is on the second floor of the building,it has got two balconies with a beautiful view.In front of the building there are two parking lots.The building was built in 2010. Except fresh and clean air, the place also has spring of fresh water which is connected to this building,so the water in the building is free. In this apartment there are two big bedrooms, there is a large living room,a modern kitchen,a bathroom and two balconies.In the bedrooms floors are made of bamboo's parquet while the rest of the floor is covered with high quality tiles. The furniture in the apartment is spaced delightfully with modern design and colours and this apartment gives impression of idyllic and warm home. Additionally,in the apartment there is also a modern wooden stove, which is ideal for occasional cold winter's days. The apartment has 73 m2 with balconies. 75 000 euros.